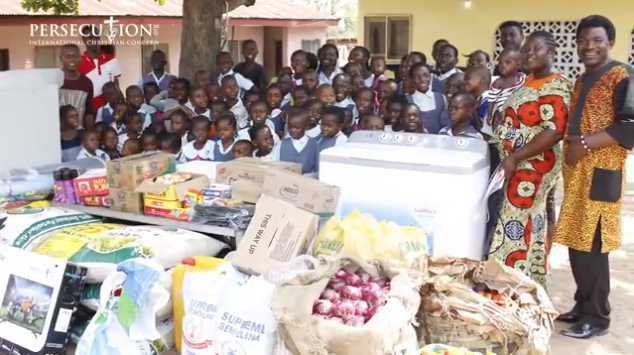 A Christian woman in Nigeria simply known as “Mama” is taking care of more than 50 children in her home in the midst of the orphan crisis that continues from the Fulani attacks and other violence in the country’s Middle Belt. According to International Christian Concern (ICC), Mama has been taking in children for at least six years, and began by receiving several orphans from her local community. As those in outlying areas heard about her care for the children, they notified her about other orphans who were in need, and her numbers began growing. “It’s an incredible job she’s doing. She has up to 54 children at this time,” ICC Regional Manager Nathan Johnson told Christian News Network, advising that the orphans range in age from 3 to 14. Johnson recently visited Mama’s home, where he was flanked by joy-filled children who would otherwise be living on the streets if not for Mama’s love and open arms. More than half of those living at Mama’s house were orphaned due to attacks by Fulani Muslims, a group that often targets Christians and devastates Nigerian villages in general. “You could see the true love that she is breathing in them for Jesus,” Johnson said, expressing amazement that the children were so happy considering the trauma they had experienced in losing their family. Johnson said that although the living quarters are tight, with multiple orphans sharing each bunk bed, the children have no complaints. Mama still would like to obtain a separate facility for schooling so that she can take in more orphans. But for the present, during Johnson’s visit, ICC was able to gift Mama with a washing machine to handle the high volume of laundry that needs to be done on a daily basis, as well as food for the children. (Photo above.) The orphans were also provided with school uniforms and supplies. Those who would like to assist with providing for Mama’s orphanage, called Tivid Orphanage, through ICC’s Kid’s Care Fund may click here.